Pick up from your hotel by air conditioned car and driven to the Boat Lagoon Marina, where you will meet the speed boat. 10.00 - 10.15 Leave Boat Lagoon Marina by speed boat and travel to Phi Phi Island. 11.00 Pass by Monkey Beach, where the speed boat will slow down so you can take pictures. From here the speed boat travels directly to Phi Phi Ley. 11.30 - 12.15 Arrival at Phi Phi Ley, where you will enjoy Maya Bay. This is the famous location where the Hollywood movie, "The Beach" was filmed. Here you can swim and snorkel in the crystal clear waters. All snorkeling equipment is supplied to you free of charge. 13.00 Arrival at Lho Sa Mah Bay and Pi Leh Cove. Here you can once again enjoy some time to swim, snorkel or relax. 13.45 A mini sightseeing tour of "Viking Cave" a highly revered area amongst the local people who come here to collect Swift's nests for making soup. 14.00 Next stop is Leamtong Beach, where you will enjoy lunch at a local restaurant. After lunch there will be free time to take a walk along the beach. 15.15 Depart for Hin Klang, where you can leave the boat and enjoy some snorkeling in the calm waters. Here you will find a beautiful coral reef which is very interesting to explore while you snorkel. 15.45 Arrival at BamBoo Island, here you can take some time to swim or simply relax on the beach. 16.15 Depart for Khai Nai Island, where you can continue relaxing on the beach. 17.30 Arrive at Boat Lagoon Marina. You will then be taken back to your hotel. Enjoy a full day out to visit one of Asia's most beautiful islands. Ko Phi Phi (หมู่เกาะพีพี) is a small archipelago located in the Krabi Province. It is around 48km south-east from Phuket, 42km south from Krabi Town and 40km from Ao Nang Beach. Like the other islands in the group, Ko Phi Phi Don is a non-volcanic island largely made of limestone. It is the largest of the islands and also the only populated island. Ko Phi Phi Don is very popular for diving and snorkeling activities. Also known as Ko Phi Phi Lai, this is a smaller island to the south. This was also the backdrop for parts of the Hollywood movie, "The Beach" which was filmed on location in Maya Beach. Also known as 'Bamboo Island'. This is a small low-lying island located to the north of Phi Phi Don. It lays close to Ko Yung. It is noted for having several excellent beaches on it's north and eastern sides. Located to the south of Phi Phi Leh, you will see two small adjacent limestone formations rising from the sea. 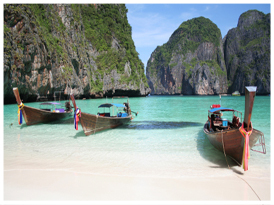 This area is particularly famous for being the best scuba diving sites in Phi Phi.